Women undergo emotional and physical discomfort before and during their menstruation which makes this time inconvenient for any kind of physical sports. 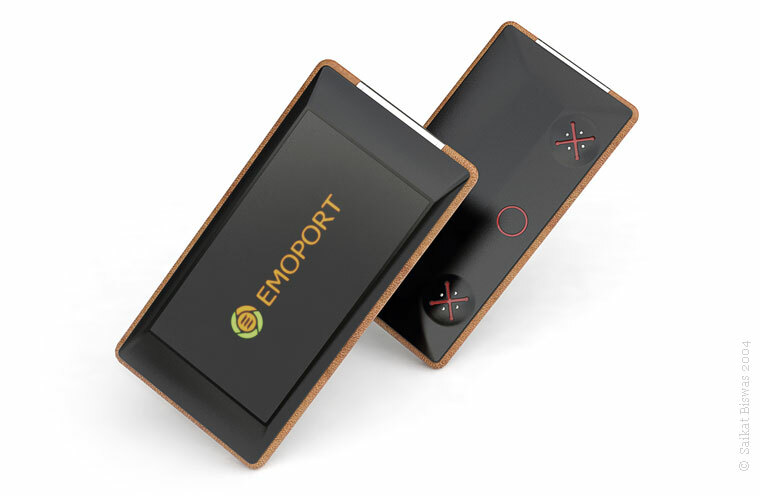 EMOPORT is a personal emotional vitalizer which helps to overcome the mental stress during this period. The name has been derived from emotion-sport . This device can be personalised by feeding one's personal data like age, weight etc and then it automatically keeps track of the menstrual cycle and can only be used by her. All personal data are password protected. The software/games for this device come in a small flash memory card but it is not available as a separate commercial product. 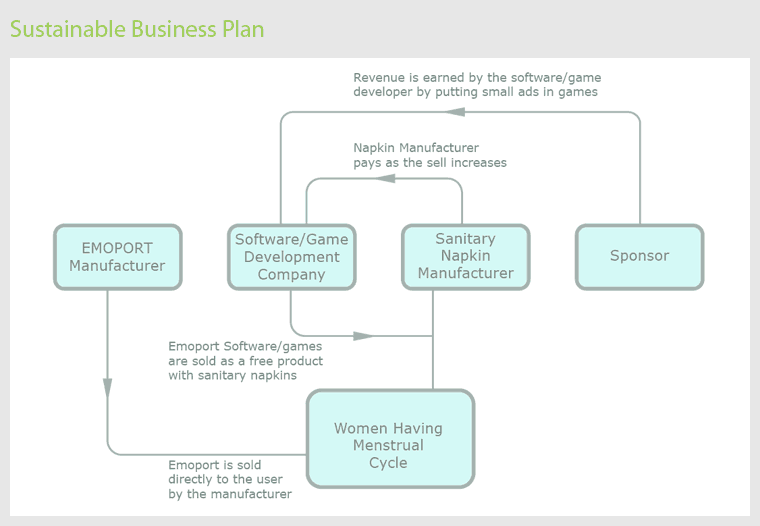 These software,games come as free products with sanitary napkins, which can be played only before and during menstruation. After that, the device goes into sleep mode until the next month's time. The games,software are not just 'pink painted' versions of the existing 'boys' games'. Extensive research,user surveys are carried on to decide the game content and the overall game design and development for creating entirely new software/games for different age-groups of women. We all have subconscious beliefs about menstruation and often, it's not positive. This new product would help one step further to reframe this attitude by making this period enjoyable. The business plan of emoport as a standalone product is shown above. Emoport-software/game titles are not sold separately as commercial product; they are available only as a free product with sanitary napkins. These can be used for limited period only during menstruation. Although the above business plan is based on a standalone product, but the same concept could be taken forward as a service which comes with other products/services such as Mobile phone/PSP etc; Which might be more discreet as a solution, as there won’t be any ‘stamped’ product related to the emoport service. The main idea behind the form was to make it more generic, as later on different models would be coming, catering to customers of different age groups, where the designs would be focused towards respective age groups. 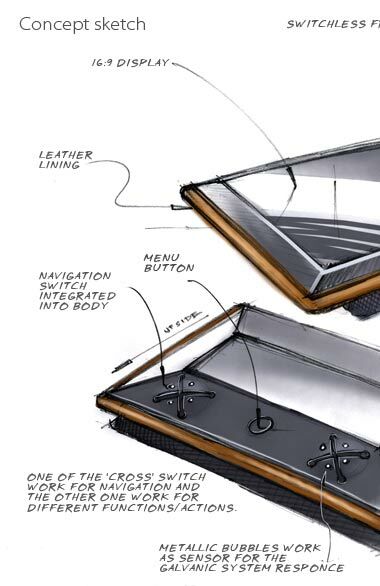 In earlier concepts forms seemed to be influenced by the existing palmtops, cell phones or iPod like products...but the final form is successful to avoid those even though it follows contemporary design language. The expression of the form is valuable but not expensive and humanized electronics. 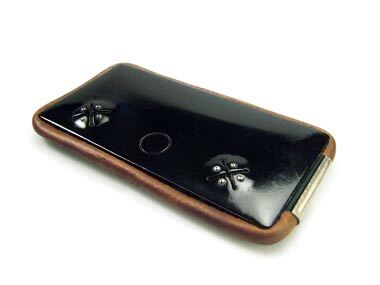 Features: Emoport is a personal emotional vitalizer for women. 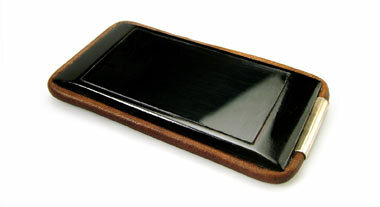 It has a 16:9 high resolution LEP (light emitting polymer) display. 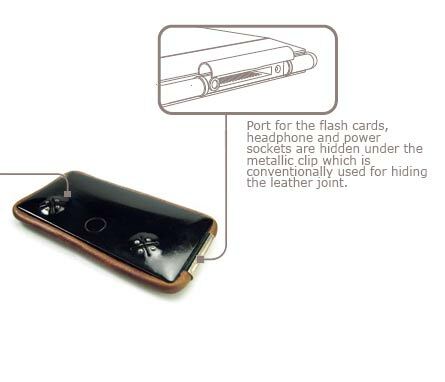 It has a port which accepts flash memory card specially developed for Emoport. It has a built in biofeedback system based on Galvanic-Skin-Response(GSR) which helps the user to keep track of her stress. It runs on rechargeable lithium ion battery. Design: Emoport has been designed in such a way so that women can emotionally relate to it. The stereotypes for women's products like pink, purple or other 'feminine colours' with soft edges and blunt corners are avoided consciously. 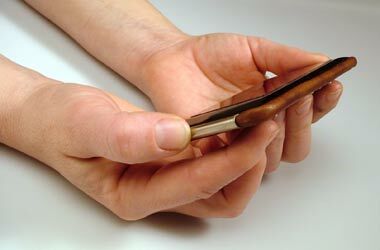 One feature of the form is, though it is 10mm in total thickness, the chamfers makes it look much thinner. 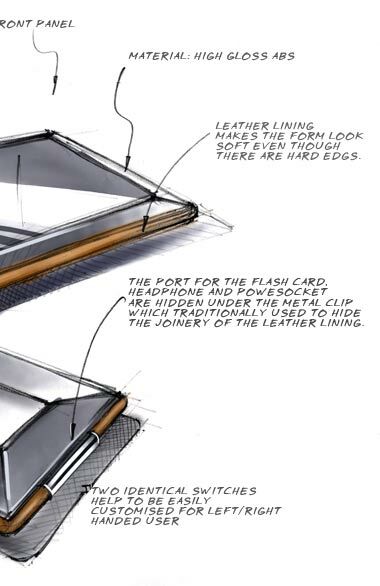 Even though it has sharp corners but the leather lining all around makes it humane.